Diagnosed at age 4, Barbara Pruitt reflects on the challenges, celebrates the triumphs and looks to a bright and hopeful future for people with ITP. As Barbara Pruitt stood greeting new attendees at ITP Conference 2018 she was introduced to a couple intrigued by the details of how she manages the disease. 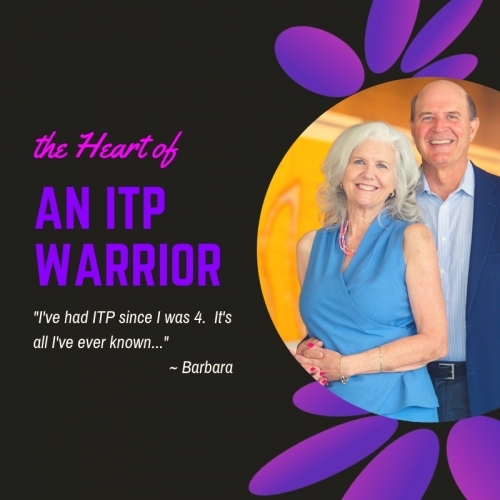 “You live with a platelet count under 10,000,” exclaimed the attendee, “I can’t even begin to imagine how you do it!” Barbara smiled, shrugged her shoulders and replied, “I’ve had ITP since I was four. It’s all I’ve ever known.” In living a lifetime with the disease, Barbara has certainly seen the outlook for people living with ITP change. “I didn’t know anything was wrong,” Barbara recalls, “but my mother was really worried about all of these black bruises I had.” Growing up with three brothers, Barbara’s mother questioned the older two about fighting with their sister, but a visit to the doctor revealed what, back then, was called thrombocytopenia. In the 1960’s, along with the diagnosis came one therapy to treat ITP - steroids. “It was hard, there were severe side-effects – weight gain, water retention and sleepless nights,” she said and after three years of trying to control the disease with steroids, Barbara’s parents and hematologist decided it may be time to try removing her spleen. For three months, Barbara enjoyed remission, but after receiving the oral polio vaccine, she relapsed. “I’ve lived with low counts my whole life. My parents chose not to treat with medicine, so I went through childhood being careful,” Barbara said. She was restricted from sports, but was kept busy with ballet, swimming, Girl Scouts and choir. As anyone with ITP knows, it was difficult recognizing there were certain things she couldn’t do and exhausting to repeatedly explain the bruising. “People always asked about my bruises. When we moved to Miami, the neighbors thought I was abused until they met my parents and understood what was happening,” Barbara said. “As a child, it was lonely. I never met another person with ITP until my first PDSA conference in 2004 in Baltimore. That’s why the Kids Kamp and the Teen meeting at the conference warm my heart. I never had another teenager to talk to or relate to and they do. Although your family loves you and cares about you, and friends want to help you, they don’t know what it’s like to walk in your shoes. The first time you meet another person with ITP, you are immediately kindred spirits…because you understand,” she continued. At 16, Barbara met her husband, PDSA Board Chair, Peter Pruitt. “We were dating for a while and it was getting serious and having children was always a concern, so I took Peter with me to the doctor to talk about having children. The doctor said, ‘you need to live your life and we will address it when you get there. You should get married, go to school, study and do what everyone else does’,” Barbara said. They took the valuable advice and five years after they wed, Barbara became pregnant. “It was extremely exciting,” Barbara commented. “We decided we were going to have a child despite the risks,” Peter added. “We were fortunate to have good doctors and Barb went to one of the top hematologists at the time,” he continued. After nine months of close monitoring, consultations with other specialists and a platelet count of 16,000, Barbara had their daughter, Ashley. Delivered via C-section, their otherwise healthy baby girl also presented a platelet count of 16,000. Barbara’s antibodies had crossed the placenta and killed Ashley’s, but within five months, her count rose, and Ashley has been fine ever since. “Our daughter went straight from the delivery room to the children’s hospital,” Peter began, “Barb didn’t see Ashley for five days. I would shuttle between the two hospitals to see Barb (in intensive care) and our daughter. It was very exciting but also a very stressful time. We were concerned, but they assured us Ashley would be fine. In many ways, it was a different world – there’s so much more information today that I think you worry more, driving yourself crazy with different thoughts,” Peter laughed. But within a week, the Pruitts headed home, began their life as a family and what would also prove to be the most trying times of Barbara’s ITP journey. Although Barbara’s healthcare team saw her through a successful pregnancy and delivery, Barbara’s doctor recommended she not have another, but for the Pruitts, their family was not complete. Always planning on more than one child, Barbara and Peter had discussed adoption prior to marriage and three years after the birth of Ashley, they adopted a son, Peter III. “It was as though God had told us not to have another child because what I didn’t realize was that when I was 19 years old and was given Vincristine (a chemotherapy agent), unbeknownst to us or medicine at the time, it killed my ovaries, so around 27 or 28, I went into premature menopause and wouldn’t be able to have more children anyway,” Barbara said. Barbara often encourages those new to ITP to find their “new normal” - solid guidance delivered from someone who learned by living the journey. “The most difficult time in my life was when we had two small children,” Barbara began. “Little ones are full of energy and I was not. The fatigue was horrible, I had no choice, but to keep going. I always volunteered – at church, at school and the kids’ activities and I had to learn the hard way. I was one of those people who always said ‘yes’ and had to learn to say ‘no’. It’s very disappointing not to do what you want to do, but when you have ITP, you need to prioritize your energy. And once you have, you need to re-prioritize it every day because your energy level changes daily,” she said and as normal, time marched on. The children grew and so did the Pruitt’s journey with ITP. Barbara volunteered, joined the PDSA board of directors and eventually became board chair. “She was excited when she found the organization – it was her thing,” smiled Peter as he recounted how he became involved. “She went to conferences, did all these things and became the board chair. I hadn’t been to anything and one day, I’m sitting in my office and Barb comes in and says, ‘I need you to do something for me.’” At that time, Barbara was enrolled in clinical trials for TPO agents and they were hard on her. Her fatigue got worse and she knew it was time to step down from the board. She knew that Peter’s business background would be a tremendous asset to the organization and she was right. This year, Peter celebrated ten years as PDSA board chair. “I was a nurse and understood the medical side, but governance is Peter’s thing. He’s served on several large non-profits and now he’s done a great job helping PDSA grow. And that makes me really happy,” said Barbara as she smiled. “PDSA is a great organization. It’s done so much to help people in Barb’s situation who have no information and even those who do and because of all it offers, it’s been very rewarding for me as well,” responded Peter. Today, Barbara frequently takes patient calls and shares her story, appreciating the ability to give back. While the vast majority of patients find something that helps them, there is a small number like Barbara who don’t. She is completely refractory and has chosen not to treat with medication but maintains hope that one day there will be a therapy that works for her. Her insight and experiences present a unique perspective for many newly diagnosed young adults – that although they are struggling, the best path is to educate yourself, accept help when needed and live life because it will most likely be just fine. 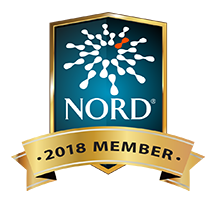 Barbara encourages patients to utilize all the resources available to them – support groups, educational information, and of course, the annual conference. “I have a lot of hope for the future, because it’s not hopeless like it was thinking this is how I’m going to die, ITP will be the reason. Having access to all of this information and access to top doctors has been a gift. Finding PDSA has opened doors for me by meeting specialists from around the world. I’ve testified at the FDA for new treatments to let them know that we need choices. I’ve spoken to a hematology group at the FDA about the challenges of living with ITP and am serving on the ASH (American Society of Hematology) Committee to rewrite the guidelines for ITP. There are currently a lot of therapies in development and that is very exciting for people with ITP,” smiled Barbara. The couple celebrated several other milestones in 2019. In addition to a new grandson and their son’s engagement, Peter and Barbara celebrated their 40th wedding anniversary. “Peter has been my biggest supporter all these years and I’m sure it hasn’t always been easy for him. I went through many trials and was not there as mother and wife because I was in bed, so he gets his halo polished regularly by me,” Barbara said smiling at Peter. “My halo polished? Yeah, right! You mean my head,” he exclaimed.